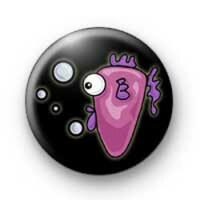 Pink fish Button Badge in black with a super cute illustration of a fat fish in pink with purple fins & blowing big bubbles. This fish badge makes up a selection of fish & sea creature badges we have available on the website. We have tropical fish in all shapes, sizes & colours so be sure to have a browse through our cute badges category or use the search box to find his friends. Super cute sea & ocean inspired 25mm fish badge made by hand in our UK workshop.